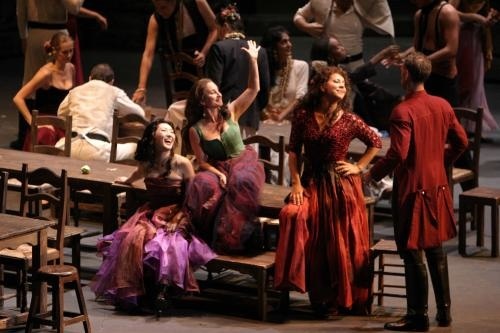 Through a study in contrasts, LA Opera’s humanistic Carmen encompassed at once the passion, frailty, and psychological vulnerability of Georges Bizet’s tragedy. The unique set and color scheme, a soothing sea of pastels (as opposed to the standard bright red motif) and white walls conjured a Caribbean island, thus evoking a carefree mood. 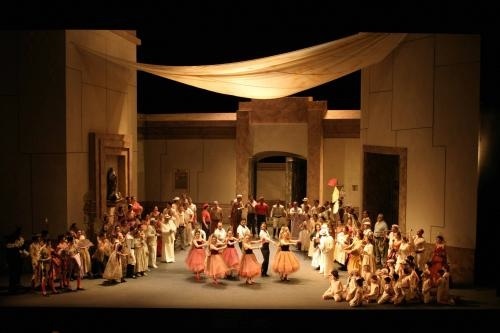 The peach palette of the set, designed by Gerardo Trotti, proved successful in providing a sharp contrast, thereby bringing the passion of Carmen to the foreground. The soft hues and blithe island atmosphere had a second positive effect: to cleverly lull the audience into a false sense of serenity so that the bloodshed at the end becomes that much more shocking. Carmen, as played by Viktoria Vizin, also proved a study in contrasts. Physically, Vizin looked every inch the part and moved with a limber, sensuous litheness that convincingly lured every red-blooded male into her seductive snares. Vizin’s voice proved softer than past Carmens, but this trait added to the complexity of her character. Instead of an imposing siren, Vizin’s Carmen conveyed a fragility that humanized the enchantress. This quality proved particularly effective in Vizin’s intimate, confidential interpretation of “Près Des Remparts de Séville,” that drew the audience into the psychological drama. As Don Jose attempts to resist temptation, the audience asks Will he or won’t he? The Sub Rosa texture in Vizin’s voice suggested that at that moment, Carmen herself does not know, heightening her vulnerability, the suspense and making the story fresh, even for those familiar with the outcome. As a foil for the promiscuous and volatile Carmen, Genia Kühmeier sang the role of the virtuous Michaela with a strength and purity that conveyed her confidence in her moral quest. Kühmeier’s powerful rendition of “Je dis que rien ne m’épouvante” clearly conveyed her unfaltering determination to remain undaunted in the face of danger. In addition to the set and the music, Jesús del Pozo’s exquisite costumes added to the overall meaning of the opera. Del Pozo paired elegantly detailed pieces like Carmen’s magnificent red dress in Act III or her splendidly avant-garde coat in Act II with simple contemporary touches like jeans, black pants, and sweaters. This juxtaposition of the antique with the modern through Del Pozo’s costume design remind the audience that tragedy exists today, in accounts of violence in the newspapers, on our city streets, and behind closed doors. Finally, a humorous and insightful pre-concert lecture by Spanish Consul General, Inocencio F. Arias, at a reception hosted by Hispanics for LA Opera, revealed the nationalistic contrasts inherent in the opera, Consul General Arias ultimately deemed Carmen to be decidedly un-Spanish. The Consul stated that naming a protagonist “Bullfighter” is an embellishment as stereotypical as calling a character “Clown.” Mr. Arias determined that, despite its Spanish setting, Carmen exhibits overwhelming French attributes. In the end, however, the national identity of the opera does not invalidate its charm. After all, a French opera, set in Spain, with Caribbean decor, performed in Los Angeles with a Hungarian Mezzo-Soprano, can still enthrall, entrance, bewitch, and beguile. And a scene from Professor Carolyn Bremer’s new cyberpunk opera Laughing out Loud! Ticket Office Direct Line: 562-985-7000. Tickets may also be purchased at the door. Innovation proved the theme of the night at Tuesday’s concert comprised of Ian Wilson’s Heft, for Flute and Piano, Franz Schubert’s Arpeggione Sonata. D. 821, and Johannes Brahms’ Piano Quartet in G. Minor, Op.25. Each of these pieces embodies a pioneering attitude, uniting the program into a cohesive whole of creativity, ingenuity, and vision. Franz Schubert wrote Arpeggione Sonata D. 821 for an unusual new invention, the Arpeggione, a cross between a cello, guitar, and viola de gamba. Although Tuesday’s performance consisted of the piece transcribed for viola and piano, Richard Yongjae O’Neill’s virtousic and subtle interpretation (one that has resulted in his recording of the piece going platinum in Korea) personified the innovation that marked the night’s theme. Johannes Brahms represents another avant-garde composer in the musical world. Arnold Schoenberg called him “Brahms the Progressive,” music critic William Youngren labeled him a “Proto-Modernist,” and pianist and theorist Charles Rosen dubbed him, “Brahms the Subversive.” Although Brahms composed in the nineteenth century, twentieth century composers, like Schoenberg, hail his style as distinctly modern. The Piano Quartet in G. Minor, Op.25 exemplifies progressive techniques including experimental harmonic language and asymmetrical phrasing. Violinist Nurit Pacht, violist Richard Yongjae O’Neill, cellist Lars Hoef, and pianist Kevin Fitzgerald performed the Rondo alla Zingarese on the edge, a frenzied, unrestrained rendition lauded by an audience, thoroughly captivated by the gypsy mood. The program commenced with Ian Wilson’s Heft, for Flute and Piano, in which the opening section of the work was inspired by a quotation by the Egyptian conquerer, Amr Ibn Al-As, “I dreamt that heaven lay close upon the earth, and I between them both, breathing through the eye of a needle.” The flute in Wilson’s piece convincingly mimics the human breath as the audience awaits each carefully constructed note; each subsequent note becomes more vital than the previous one, like breathing itself. Wilson aptly titled his work “Heft,” a word with layers of meaning. The noun definition of Heft refers to weight, heaviness, importance, and influence. The verb definition of Heft signifies to raise, to elevate, or to test the weight of something by lifting it. The double-entendre in the title of Wilson’s inventive piece thus drives at the essence of music and its manifold purposes. Music is crucial, vital, and often weighty and dense. At the same time, music aims to raise and elevate the human intellect, heart, and spirit. 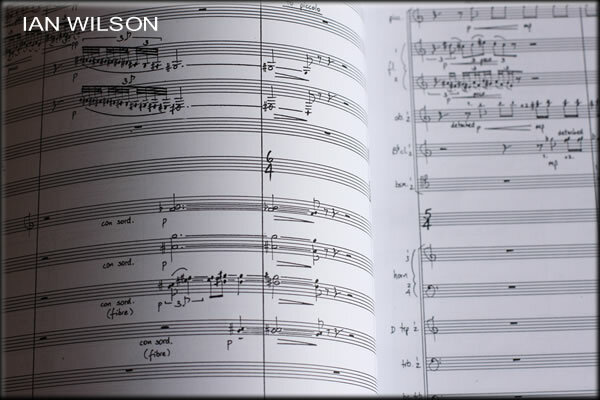 The last definition, “to test the weight of something by lifting it,” is particularly fitting for modern music, like Wilson’s piece, which challenge traditional audiences to open their minds to unfamiliar and often complex new horizons, which make the musical journey that much more worthwhile. This week’s Cultural Cocktail Hour involves a blend of competition, mystery, and invention- enjoy! The Metropolitan National Council Auditions unearths raw talent across the nation with the goal of bestowing exceptionally talented singers with the opportunity to compete on the stage of the Metropolitan Opera in New York. During the Regional Finals at Bovard Auditorium, young opera singers will compete to win a trip to the National Semi-Finals concert held in New York. 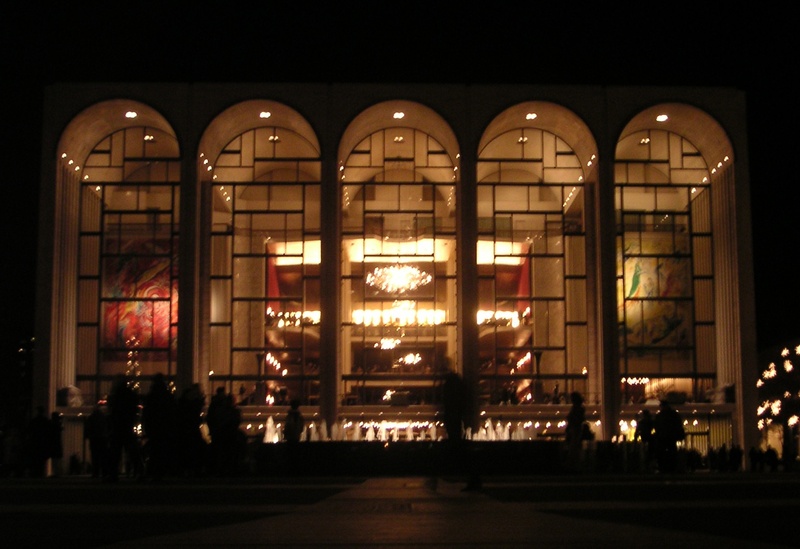 The Metropolitan Orchestra accompanies the eventual Grand Finals Concert at the Met, which is broadcast nationwide on the Metropolitan Opera Orchestra. The National Council has provided awards to many of the world’s most illustrious opera singers including Renee Fleming, Deborah Voigt, Ben Heppner, Susan Grant, and Frederica von Stade. Renee Fleming, past MONC winner. Fri. Nov 14. 8:00 p.m. Sat. Nov.15. 2:30 pm;8:00 p.m.
Sun. Nov. 16. 1:00 pm; 6:30 p.m.
Who killed Elizabethan playwright Christopher Marlowe? Was her targeted for his allegiance to the secret society of independent minds, The School of Night? Take advantage of the Center Theatre Group’s Entertainment Stimulus Package – which will make 100,000 tickets available at a $20 ticket price. Sun. Nov. 16. Temple Beth Torah, Ventura. 3:00 p.m.
Tues. Nov. 18. Huntington Library San Marino. 8:00 p.m.
Thurs. Nov. 20, Zipper Hall, Los Angeles. 8:00 p.m.
Adrian Spence, flute; Richard Yongjae O’Neill, viola; Lars Hoefs, cello; Kevin Fitz-Gerald; Violinist Nurit Pacht. 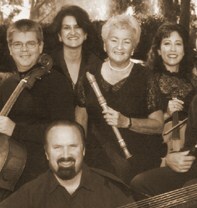 Tickets for the concerts, as well as additional information on Camerata Pacifica can be found at www.cameratapacifica.org or by dialing toll-free 1-800-557-BACH. 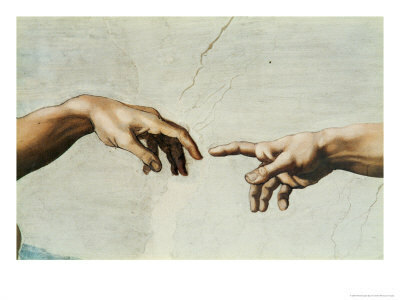 During an economic downturn is Art a luxury or a necessity? The Los Angeles Times reports that the troubles of the Pasadena Symphony, Opera Pacific, and the Geffen Contemporary represent but a few examples of artistic collateral damage in Los Angeles. When the economy goes down, arts are the first to get slashed from any budget. People simply cannot afford the arts, that muse who sits too lofty on Mazlow’s hierarchy of needs. Or can they? A quick observation of Pasadena’s Old Town on a recent Saturday evening reveals crowds with still-disposable incomes huddled inside the Cheesecake Factory waiting to spend their dollars on a caloric feast. Let them eat cheesecake. Lines of designer label-clad youth still line up on Sunset Boulevard outside of the latest club du jour, flashing wads of cash at the barbarians at the gate in order to have the privilege to spend even more money on alcohol, cover charges, deafening music, and the opportunity to become desensitized. Therefore, many still have the economic means to get desensitized while denying the opportunity of refining the senses through the symphony, the opera, or fine art. The reduction of the arts in the City of Angels is not an issue of finance; it is an issue of priorities. A friend from Russia once remarked to me, upon seeing a vast sea of silver patrician heads last year in the audience of the Pasadena Symphony, that in Moscow concerts were not the exclusive domain of well-heeled patrons, those on the upper echelons of the social ladder. Families of modest means would dine on cabbage soup for a week in order to be able to take their children to see the virtuoso Vladimir Horowitz in concert. One need only to look at Venezuela, a country where the average income is a mere $3,490 a year, and, where the youth symphony embodies a national priority. More than 400,000 of Venezuela’s youth have participated in this program, saving themselves through musical dedication and discipline from a life of gangs, criminality, and destitution. In an interview with the Boston Globe, Venezuelan conductor José Antonio Abreu declared that musical programs in Venezeula functioned as a “weapon against poverty.” In Venezuela, classical music represents a vital component of the popular culture and progress, not a sanctuary for economic elites. If only many Angelenos could look at classical music and fine arts through the same lens: not as a luxury item but as a central building block of the social fabric and future of our city. The Dutch humanist and scholar Desiderius Erasmus once remarked, “When I get a little money, I buy books; and if any is left, I buy food and clothes.” Unfortunately, in Los Angeles, this proverb exists in the reverse. 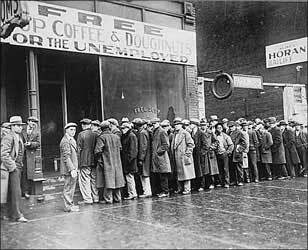 Citizens first shell out money for dinners, libations, or a fetching new outfit, with nothing left for the Grapes of Wrath (an opera now cancelled by Opera Pacific) or the holiday concert at the Pasadena Symphony. The arts crisis in Los Angeles is not a reflection of the economy; it is a reflection of ourselves: our desires to feed our bodies at the expense of nourishing our souls.